Thirsty Pilgrim: Germany's Secret is No Secret. Ludwigsburg is a nice town just outside of Stuttgart in Baden-Württemberg. It has a friendly commercial center and a Baroque palace that was something like a hunting lodge gone out of control (as Baroque palaces are wont to do). The town also has two brewpubs, by the way. And they're both pretty good. But you won't be going to Ludwigsburg just for the beer, will you? Bamberg? Sure. Köln, Düsseldorf, Munich, and even Berlin... I've been to all those cities mainly to drink their beer. Many of you would shamelessly do the same. That's the sort of sick people we are. But those are not the places that make Germany a great beer country. I'm going to repeat that: Those are not the places that make Germany a great beer country. 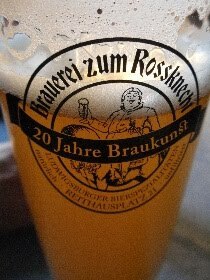 Brauerei Zum Rossknecht in Ludwisgburg... Now that's the kind of place that makes Germany a great beer country. Why? Because it's a neighborhood pub than makes great beer in a medium-sized town. Rossknecht will never be famous among geeks. It's famous enough among the locals, and welcoming to any pilgrims who stop in. And that's enough. The usual options are a grassy, unfiltered Urhell and a decent Weizen. The seasonal when we visited last winter was a stunning Winterbock with notes of toffee, chocolate and dark currant. But on both my visits I came back to that Urhell. Again and again. The other brewery in town, Sudhaus, is across the road from the train station. Where Rossknecht is a bit more traditional and homey, Sudhaus is younger and rambunctious. I remember a passable Weizen beer, a better Dunkelweizen, and yet another cracking Helles, which according to my notes has an addictive lemony character. Expect classic rock and sing-alongs at volume. Incidentally: What makes Germany a great beer country is happening in the U.S. these days too, particularly with its emphasis on brewpubs. More and more little towns are getting their own, and most are making pretty good beer. Most will never make a dent among on the international geek scene, thankfully, but they can be famous to you and me. And that'll be enough. It's all about the Weihenstephaner brewery for me - love it. There Korbinian is a supreme beer. That and Ayinger - they make some lovely beers. A few German beers can all get a bit samey for my tastes but these two breweries really hit my taste buds. This is exactly the same that is making the Czech Rep. a great beer country, too... Brewpubs, tonnes of them, in most cases with really good beer, and many times hidden in remote corners of the country where no tour buses would ever venture. I disagree because I think you're constructing a false dichotomy. The great breweries of Köln, Düsseldorf, Munich and Bamberg are just as much everyday haunts for locals as your brewpub in Ludwigsburg is. I don't know enough about Berlin to comment, and yes the Hofbräuhaus and even Schlenkerla are sometimes full of tourists, but overall I think those are exceptions. To the locals, Spezial lager or Mühlen Kölsch are the local, everyday beer. That's what makes Germany a great beer country. Barm, you're on to something there. Still, I think it's fair to draw a distinction between the handful of places that get geeks all worked up and the other 99% of the country, where tasty, locally made beer is never far away. But just to confirm your point: One of my favorite places on Earth is Schneider's Weisses Brauhaus in Munich, where I get fits of jealousy when I see all the regular locals' Stammtisches that go on there.